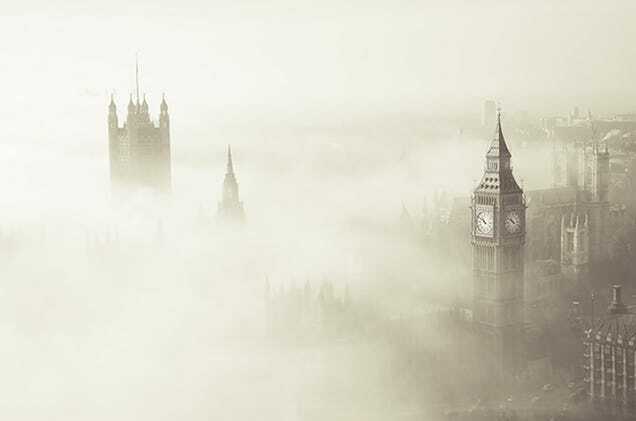 On December 5th, 1952, a veil of fog rolled over the city of London. It was the start of the deadliest air pollution disaster in British history, and more than sixty years later, an international team of chemists has figured out why. Locals paid little heed to the fog at first—after all, foggy days have been a hallmark of life in Britain for thousands of years. But by late afternoon, the sky had taken on a yellowish hue and was beginning to smell like rotten eggs. The next day, the air was the color of pea soup and reeked of foul garbage. As the hours wore on, visibility got poorer and poorer, and breathing outside became painful. This torture went on for five days. By the time the fog lifted on December 9th, 150,000 people had been hospitalized. Experts now estimate that over 12,000 men, women, and children died from exposure to the befouled air. London’s Great Smog, as the disaster is now known, was immediately (and correctly) blamed on coal. But the details of what exactly happened remained elusive for decades. Now, through laboratory experiments and atmospheric measurements in two pollution-prone Chinese cities, Xi’an and Beijing, a team lead by Texas A&M’s Renyi Zhang has worked out a likely explanation for the Great Smog and other deadly air pollution events around the world. Their work is published this week in the Proceedings of the National Academies of Sciences. One of the hallmarks of the Great Smog was sulfate, particles of sulfuric acid that not only contributed to its hue and odor, but its toxic effects on humans. In their study, Zhang and his team demonstrate that under naturally foggy conditions, sulfate will build up inside water droplets due to chemical interactions between sulfur dioxide and nitrogen dioxide. Sulfur dioxide and nitrogen dioxide both come out of coal-fired chimneys, and to a lesser extent, out the tailpipes of automobiles. Sulfate, in turn, helps promote the formation of other particles, including nitrate and organic matter, exacerbating the development of severe haze. Eventually, as the water in fog dries up, the acid becomes concentrated, leaving corrosive, gross looking haze particles that coat every surface they come in contact with, from sidewalks to human lungs. The study found that similar chemistry is responsible for smoggy skies in Beijing and X’ian, although in these cities, agricultural chemicals like ammonia can play a role, too. While it took a certain combination of chemicals and unfavorable weather for the Great Smog to develop, overall, the study suggests that the conditions behind this deadly event can, in theory, develop all over the world. If there’s one silver lining to the Great Smog, it’s that it kickstarted an environmental movement that led to the passage of some of the first clean air laws. Now that we’ve worked out more of the finer details, the impetus for ridding the world of coal seems stronger than ever.